The engineer of the Amtrak train that derailed Tuesday night in Philadelphia, killing seven, has been identified by NBC News. Brandon Bostian was at the controls of the train that the National Transportation Safety Board said Wednesday was traveling at 106 mph on a stretch of tracks in Port Richmond with a speed limit of 50 mph before it jumped the tracks on a sharp curve. Philadelphia police said the engineer had declined to provide detectives with a statement Wednesday and left the East Detectives Division with an attorney. Bostian, 32, of New York City, was a nine-year Amtrak veteran, according to his LinkedIn page. He has been a passenger engineer for the last four years and four months. Previously, he spent four-and-a-half years as an Amtrak conductor. He holds a business degree from the University of Missouri-Columbia. Robert L. Sumwalt, an NTSB board member, said speed was just one factor investigators would consider, and that the black box, also known as an events recorder, would help determine whether excessive speed played a role in the derailment. Trains are expected to enter the curve where the derailment occurred at 50 mph, Sumwalt said. The engineer operating the train applied the emergency break, which slowed the train from 106 mph to 102 mph before it derailed. Advanced Civil System Speed Enforcement, a technology designed to keep trains operating below maximum speeds, is not installed along the curve where the train derailed, Sumwalt said. "Our mission is to find out not only what happened, but why it happened, so that we can prevent it from happening again," Sumwalt said. 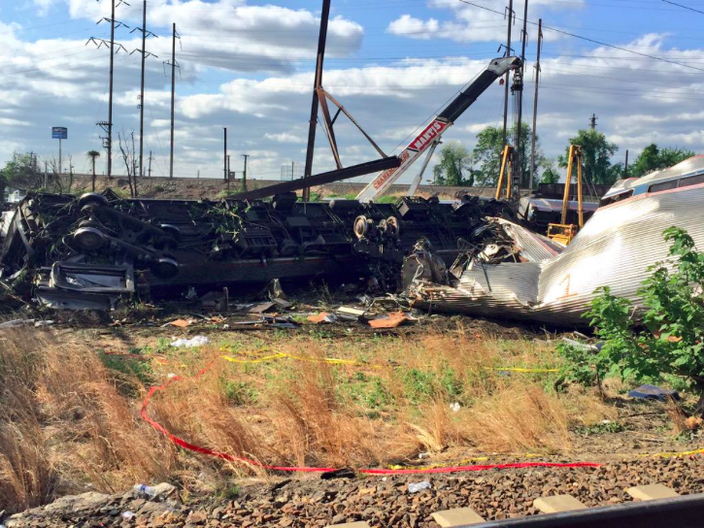 NTSB investigators are expected to remain on the scene for collecting "perishable" data for about a week. Sumwalt said the NTSB wishes to speak with passengers and crew. NTSB investigators said they have not yet spoken to Bostian. "We want to interview him," Sumwalt said. "We want to review his training records and his employment records. That's standard." The conductor, whose name also has not been released, is being treated at Einstein Memorial Center for a skull fracture. Rescue workers were searching through the wreckage in Port Richmond throughout the day and investigators looked for a cause for the derailment that injured more than 200. According to Mayor Michael Nutter, the train's black box has been recovered and is being analyzed at Amtrak's operation center in Delaware and declined to discuss reports that the train may have been speeding. "Let's please not try to speculate," he said. Nutter said search crews would “not cease efforts until absolutely sure we’ve gone through each car,” and that the search site has been expanded in case anyone might have been thrown from the train. It's still unknown who was on the ill-fated train and who may remain missing. "We're not going to get into who we have and don't have," the mayor said. Officials said eight people remain in critical condition. Hospital officials say those patients are not deemed to be in life-threatening condition. U.S. Naval Academy Midshipman Justin Zemser, 20, of Rockaway Beach, New York, and Associated Press software architect Jim Gaines, 48, of Plainsboro, New Jersey, are among the dead, according to media reports. NBC10 identified two more victims from the accident. Abid Gilani, a Wells Fargo employee, and Philadelphia resident Rachel Jacobs. Jacobs was the mother of a 2-year-old child and CEO of ApprenNet, a Baltimore based company. Her family said in a statement that her death was an "unthinkable tragedy," noting that she was committed to social justice and her community. The family also requested privacy to grieve their loss. The derailed locomotive train - No. 188, headed from Washington, D.C., to New York - came off the tracks near Frankford Avenue and Wheatsheaf Lane. Cranes and other equipment were brought in early Wednesday morning to begin moving the derailed cars, 6ABC reported. The Philadelphia Medical Examiner confirmed that two bodies had been removed from the crash site, and NTSB investigators have begun their investigation. A total of 238 passengers and five crew members were on board, Nutter said. During a news conference late Tuesday night, Nutter said he had visited the crash scene, a mass of mangled metal. "It is an absolute disastrous mess," Nutter said. "Never seen anything like this in my life." Dr. Herbert Cushing, chief medical officer for Temple University Hospital where several of the injured were taken, said most of the injuries involved rib fractures and collapsed lungs and that most of the patients were in stable condition. He said only one head injury was treated at the hospital. Area residents said the crash shook the neighborhood. It felt like "a mild earthquake," said Susan Ortiz, who lives about a block from the deadly crash, "then we started seeing sparks" that lit up the neighborhood like lightning. All that separates the crash from Mary Rowe’s home of 52 years is a small factory. "I had just gone to bed; I was lying there just looking out the window and the sky lit up," she said. "I jumped out of bed; I thought 'I don't know if it is going to blow again.'" Neighbor Joe Carlin said he was listening to the Phillies game when he heard what he thought "sounded like a bomb." Afterward, some of the people on the train were walking back and forth in front of area houses, he said. "Some of them were in a daze," he said. Jim Wersler, who lives in a trailer a couple hundred feet from the intersection of Butler and Sepviva streets., was outside talking to a friend when the fatal accident happened. "I saw a flash in the sky," he said. His friend "thought it was lighting but it was brighter than that." Wersler said he then heard two booms, one right after the other and saw a plume of smoke that lasted just about 20 seconds. Brian Loftus, who lives on Sedgley Avenue, about a half block down from the accident, was outside talking to his friend. "I watched that train seconds before that train crashed," he said. Loftus said he heard a brief brake-like sound. Then "bang boom" in quick succession, then a grinding noise. There was also a flash of light: "it was bright, it was more than lightning." When Loftus went down the tracks to investigate, he saw some of the cars in the rear. "They wouldn't let us up toward the ones that were bad," he said referring to the police, which he said got there fast. "Some of the people were bloodied up pretty good," he said of the people getting out of the train. According to Loftus, one survivor told him “All I'm going to tell you there are people in there worse than what I look like.'" "I don't even want to see it," Loftus said. “That was the worst thing I've ever seen in my life. Amtrak has set up a hotline - 1-800-523-9101 – for family and friends of passengers on the NYC-bound train. “We do not know what happened here. We do not know why this happened,” Nutter told reporters. He said that the train derailed on a curved stretch of track, adding, "We have no idea what kind of speed we're talking about." There was no indication that terrorism may have been a factor in the derailment, CNN quoted the Federal Bureau of Investigation as saying. Joan Lloyd-Lendell, 56, of the 3700 block of Frankford Ave., was ordering food with her husband when the derailment occurred. "We heard a loud boom and saw a flash of light," she said. Live video on TV news showed at least one car on its side and dozens of spotlights raking the ground as first responders searched for passengers. Former Congressman Patrick Murphy of Bucks County, who was a passenger on the train, told MSNBC that his rail car flipped over, but he escaped with minor cuts and bruises. He estimated the train was traveling at about 60 or 70 miles per hour, when "all of a sudden, it went off the rails." Murphy tweeted photos from inside the wreckage. U.S. Sen. Tom Carper of Delaware had been on the train but got off at Wilmington, before the crash, he said in a Twitter message. Passenger Daniel Wetrin, riding in the train's last car, told CNN by phone he was thrown onto the floor and into the aisle as his carriage left the tracks. "Chairs were flying around, people were flying, bags, pretty chaotic," he said. "There were two people above our heads in the luggage rack." Pennsylvania Gov. Tom Wolf arrived at the scene and spoke to the press alongside Nutter around 1 a.m. Wednesday morning, pledging the support of the state in aiding the relief effort. "It just sounds horrible," Wolf said of the accounts of the crash. "The human tragedy, the devastation. I can't imagine." The American Red Cross has deployed a disaster action team to 30th Street Station to assist affected Amtrak passengers who arrived throughout the night and morning. Spokeswoman Janice Winston said the Red Cross had assisted 75 passengers at its last count. "As people have been released from the hospital, they've been coming over and meeting with us," Winston said. The relief organization has mental health professionals and spiritual care advisers on hand. It also is helping passengers as they meet with Amtrak representatives to arrange lodging or trips to their destination and will remain on hand as long as necessary to assist any passengers, Winston said. She is unsure how many more passengers will be coming through at this point but said the relief area will remain open. "We don't know right now how many people we're going to get," Winston said Wednesday morning, noting she does not know how many people remain in local hospitals. Winston, who has assisted relief efforts for various severe storms, said most passengers have been somber. "It's been a very emotional night," Winston said. "People have been very quiet. Some people have been very uplifted that we're here to talk to them." Staff reporters Daniel Craig, Christina LoBrutto, Elisa Lala, John Kopp and Michael Phillis, as well as Reuters, contributed to this story. This is a developing story. Check back here for more details.